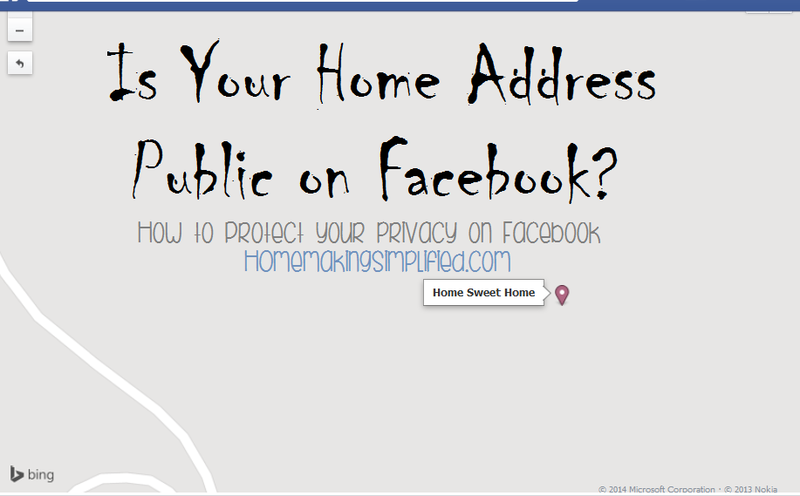 Homemaking Simplified: Is Your Home Address on Facebook? 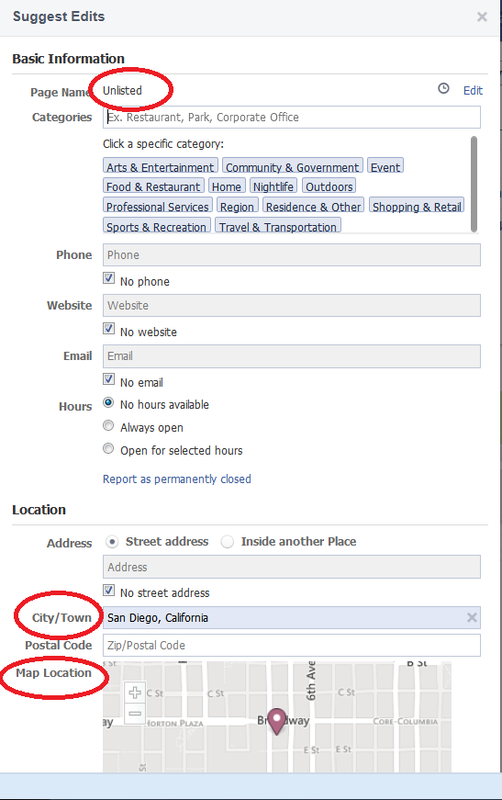 Is Your Home Address on Facebook? Yesterday I was on Facebook and was looking at a woman's profile because she stated on a mutual friend's thread that she used to live in the Middle East. I was curious about where she had lived, so I clicked on her profile and then on her places. It told me that she has lived in two places, so I clicked and to my shock, it did not tell me the two countries or even cities, but it actually showed me her two American addresses. One was a location on a street without a specific address number and the other was her full address. I was also able to see many of her frequent hang outs. I told my husband right away that I couldn't believe that this much information was available to a complete stranger (me). He told me that I should message her right away, so I did. As I was writing to her, it occurred to me, maybe my home address is publicly visible on Facebook! I finished up my quick message and then went on to check. Sure enough, my address was also listed. In the search bar, try typing in your first and last name or nicknames and see if any places come up. Go to your profile page and click on "places." It is likely under "more", and see if your address is on there. If it is, here is what to do about it. If you are the culprit, go back to your posts that you tagged and just remove the tags. If your friends have tagged your home, kindly ask them to remove the tags (This will not remove a location page if FB populated on based on a post or picture tag). 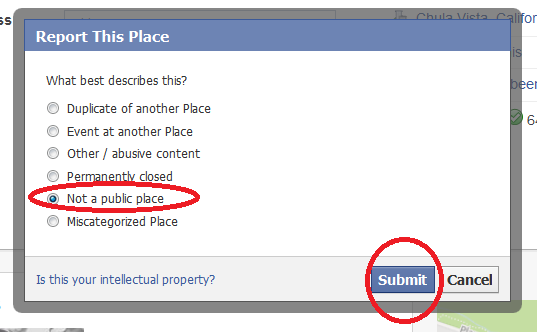 If your home does have a "Places" listing, you can visit the "places" page and report the location as "not a public place." 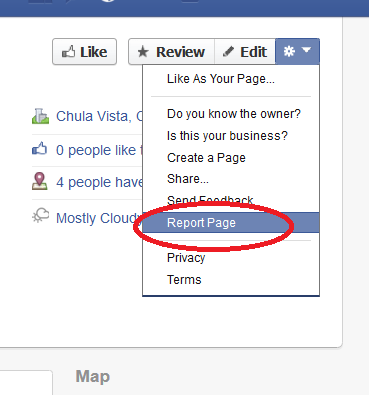 Facebook has to approve your request for removal (annoying, right? ), so while you wait, suggest edits to the page as well. I suggested changes in the location name to "unlisted", changed the city from my small town to our metropolitan city, and also moved the place-marker (by zooming out on the map and then dragging the place-marker) to central downtown (near my city's airport and away from my small town home). I also removed the category listed "home." While logged in, visit your profile and along the top menu (under your cover picture) look for "Manage Sections." You will go into a new menu. Un-select anything you do not want publicly visible from your home page. 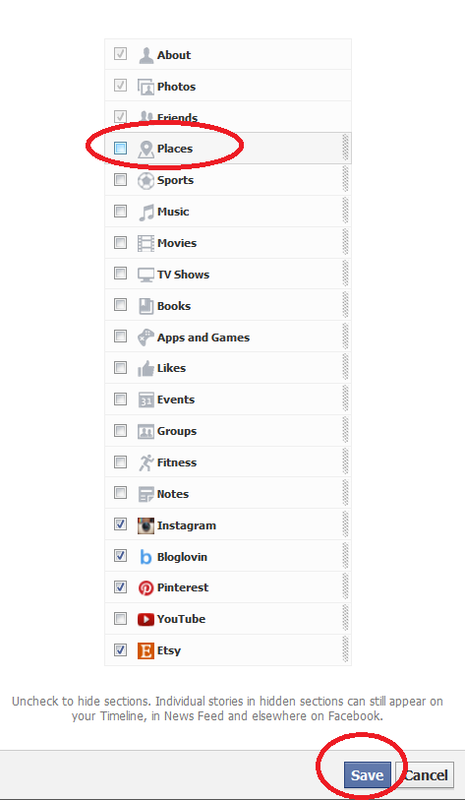 I de-selected everything except Instagram, Bloglovin, Pinterest, and Etsy as I want that activity posted and visible to all--I manage my privacy on those apps within each respective app. Make sure you save at the bottom. Once you save, you will still see the same option to manage that you did before, but other people will no longer see the un-selected options but instead will see "No Sections Available." Unfortunately, it is pretty hard to know if people are tagging your home or frequent locations on social media, especially if your name isn't tagged along with it, but sharing information like this will help people understand the implications of tagging locations that are not extremely public (like Disneyland). I don't even like the parks I take my kids to to be tagged. When I do tag locations, I try to post it after I have already left the location and make sure it is not a place near my house that I frequent. As a general rule, I only tag tourist destinations. A quick side story, I actually had a young man find me at the mall when I was 18 because he saw me post about it online. I was at a local mall and he actually drove out there to find me, and guess what... HE DID! He came and introduced himself and I was terrified! I literally ran as fast as I could and left. Lesson learned. By the way, he wasn't an old man, but someone in his 20s who I never would have looked at and thought "There's a creep right there." Creepy people come in all packages. A few months later, he ended up enrolling in my community college and even enrolled in two of my general ed. classes. Imagine my dismay when I waked into my class and saw him there after the mall incident. I ended up having to report him to the school and file a police report. He was removed from my classes and had a restraining order placed. All this from one stupid post on MySpace. Our children need to know the dangers. If you have any questions that I didn't answer, do not hesitate to ask!